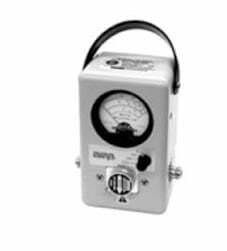 Fixed 25-1000 MHz, 5-500W, Portable Wattmeter. General purpose field power measurement from 25 MHz to 1 GHz and up to 500 watts. Uses a single broadband element with a 5-position range switch. Same rugged metal housing as the Model 43.